Sponsorship: If you are the parent or guardian of a child living at a military hospital you may sign up for the sponsorship program. We’ll connect you with an individual, family, or school class that wants to make your child feel appreciated for their service to our country. Please fill out the registration form and we will be contacting you within the next 3 business days. When a sponsor signs up the priority will go on a first come first serve basis. We will try to place families with more than one child with sponsors who want to reach out to the whole family that way all the children receive the same amount and frequency of cards. When available we’ll also pair school classes with children of the same age. That way it makes a good connection for both parties. Pen-Pals: We would like to help connect wounded warrior kids with each other throughout different stages of this unique journey. You can request a pen-pal for your child to email or write who is either still at a hospital with their parent as well or maybe even further into the recovery and already living back at home. 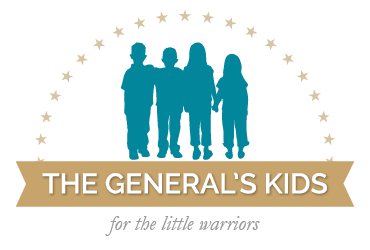 Financial Assistance: Currently we are raising funds to be able to support things that will help bring some of the normal childhood experiences to wounded warrior kids. If your family moved to a new area and your child would like to participate in local activities like sports, music and dance lessons, etc…we would want to help cover the costs. This program is still under development and hope to update this as soon as possible. Please contact Jacqueline@thegeneralskids.org for more information or with questions about this part of our programming.